The JewishAmericanSingles.com app gives you unlimited access to everything available on JewishAmericanSingles.com in a more convenient and easy to use format. 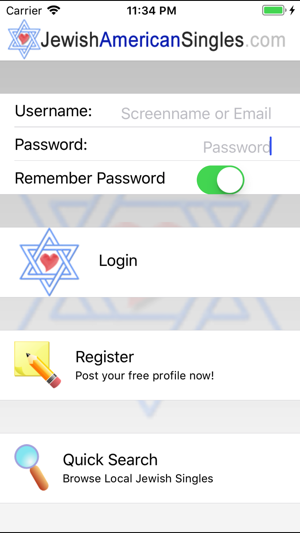 New users may register via the app or the site while existing users can use their current JewishAmericanSingles.com login. Oy - I told you Momma! Yeah, you start off with a password given to you. No biggie. You can change it once you're in. The interface is pleasant enough and the response to command works fine. The only functional problem is that one must manually log on each session (the website has the same problem BTW). So? Nu? Why so low of a rating? Perhaps it's the DLINYC (Don't Live In New York City) factor. There are very few potential dating partners on this site! Most who are offered live quite a distance away from me. I actually find many more Jewish potentials on the other, much more popular sites - those that are not religious background based! Too bad! The price is good and the objective is sound. Hopefully more people join this site or it will go the way of the dinosaurs. For now, it's like Miriam trying to find the wells in the dessert - few and far between. Been waiting 4 days to have my pix approved. Not a good start. I apologize for the delay, if your photo is not approved yet please re-upload and I will approve it right away.